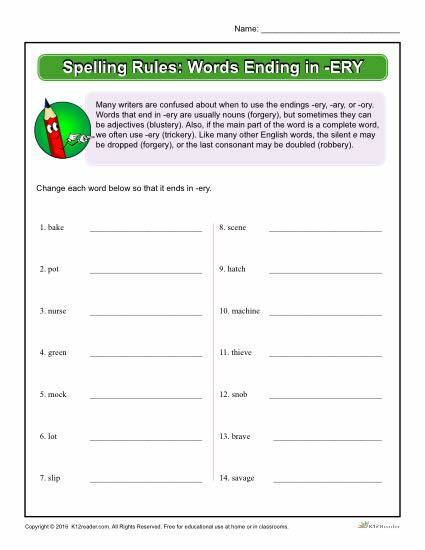 Many writers are confused about when to use the endings -ery, -ary, or -ory. Words that end in -ery are usually nouns (forgery), but sometimes they can be adjectives (blustery). Also, if the main part of the word is a complete word, we often use -ery (trickery). Like many other English words, the silent e may be dropped (forgery), or the last consonant may be doubled (robbery). Use this worksheet to better understand how to use each of these suffixes. This is great for educational use at home and in the classroom!